Defend Leftist Lecturer Eleonora Roldán Mendívil! Eleonora Roldán Mendívil, removed from her teaching assignment on the basis of slanderous charge of anti-Semitism. BERLIN – In recent months, there have been several incidents of persecution of Jewish and leftist groups and individuals in Germany’s capital for their pro-Palestinian views. The attackers range from right-wing German nationalists to the peculiar self-described (and grossly mislabeled) “Anti-Germans” (see box below). What they have in common is total support for whatever the Israeli government is doing, and virulent anti-Muslim bigotry. 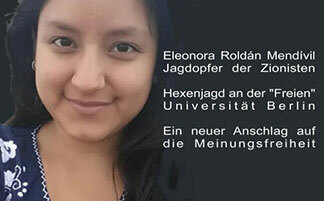 A case of anti-Palestinian censorship that gained international attention is the exclusion of Free University (FU) Berlin lecturer Eleonora Roldán Mendívil. During the winter term she taught an undergrad class on “Racism under Capitalism” under a teaching assignment contract which has to be extended before each semester (the equivalent of an adjunct in an American university). On December 25, an obscure blog, “Boasinfo,” run by a German nationalist called Andreas Boldt (who hails Trump’s travel ban and calls for more “racial profiling” of Muslims in Germany) ran a hit piece on Roldán Mendívil slanderously labeling her an anti-Semite. Shortly after, the campus group “Against Every Form of Anti-Semitism” sent a letter (January 5) to the FU president and the Otto-Suhr Institute for political science, calling for her dismissal. With unprecedented speed, and before even talking to her, the acting department head Bernd Ladwig posted a public statement (January 5) on the OSI website, announcing a decision to exclude Roldán Mendívil from future teaching assignments “at least until the accusations are cleared up.” This at a university where the main building is still named after Hitler-lover Henry Ford, even after many years of campaigning to change it! 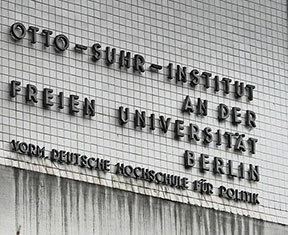 Otto Suhr Institute at the “Free” University of Berlin. What is the evidence that compels a major university to publicly cast suspicion on one of its teachers of anti-Semitism (a career-ending accusation in Germany) and to mete out the punishment before any kind of hearing or proceedings? Roldán Mendívil had signed a letter along with hundreds of artists, musicians and performers (including beloved singer Nina Hagen) demanding an end to Israel’s indiscriminate bombing of Gaza in 2014, which killed over 2,000 Palestinians, mostly civilians. She also, in her discontinued personal blog, called Israel a “colonial state,” compared its policies with South African apartheid and stated support for the boycott, divestment and sanctions (BDS) movement. The denunciation letter expressed particular outrage that such language puts Israel, a supposed “democratic nation of laws”, on a par with “regimes of injustice”1. Israel a “democratic nation of laws”?! Tell that to Palestinian children sentenced to years of prison for throwing stones at heavily armed soldiers, while an Israeli army medic guilty of the cold-blooded murder of an incapacitated Arab recently received a sentence of only 18 months! Another charge is that Roldán Mendívil helped stop an attack by “Anti-Germans” on a Maoist for carrying a Palestinian flag at a refugee demo in 2015. None of this is anti-Semitic. This entire campaign has nothing to do with a concern about anti-Semitism, and everything to do with a political witch hunt against a leftist. At a public panel discussion at OSI on “Criticism of Israel and the Limits of Academic Freedom of Debate” Ladwig confirmed this, when he bluntly said that he “honestly does not care” whether Roldán Mendívil’s statements were anti-Semitic or not. Given his cooperation with Israeli universities, he said, “such a person has no place in my house” (klassegegenklasse.org, 17 February), as if he embodied the university. Ladwig repeatedly referred to the so-called “3D test” invented by Zionist warhawk and right-wing Israeli ideologue Natan Sharansky, according to which use of delegitimization, demonization, and double standards on Israel is anti-Semitic. This former anti-Soviet spy was in charge of Israel’s illegal settlements in the Occupied Territories as minister of housing when he concocted this “test”, an obvious ploy to divert international outrage at the decades-long Zionist occupation of Palestinian lands. But beyond that, the FU administration is sending a message to employees: you’re risking your job if you publicly voice opinions the bosses don’t like, even outside the workplace. Indeed, leftist unionists, who tried to rally support for their colleague were met with resistance in their campus union groups. While only a minority of active unionists supported the campaign against Roldán Mendívil, they found de facto bloc partners in social-democratic bureaucrats who sought to keep the unions from taking a stand. Paired with an element of fear for their livelihoods if they speak up in this matter, the majority of active unionists chose to not take a side. In the case of a campaign to fight the system of contingent teaching assignment contracts (granted one semester at a time), the group decided to not mention Roldán Mendívil at a public event, in order to avoid a split. Yet an important reason for the system of short-term teaching assignments is that it discourages teachers from speaking up out of constant fear of not receiving a new contract. In the name of upholding unity, the initiative turned their back on a colleague whose case embodies the very injustice they supposedly set out to fight. Berlin teachers, whose union GEW (Union for Education and Science) also includes a small section of university employees, have repeatedly shown their militancy. Their strike actions over the past couple years to demand equal pay for equal work in Berlin’s schools were shut down by the union bureaucracy whenever the strikes started to hurt (i.e., to be effective). This militancy must be mobilized in support of the more vulnerable university employees, many of whom labor under short-term contracts that effectively prevent unionization. Eleonora Roldán Mendívil, target of the Zionist witch hunt – A new attack on freedom of opinion. 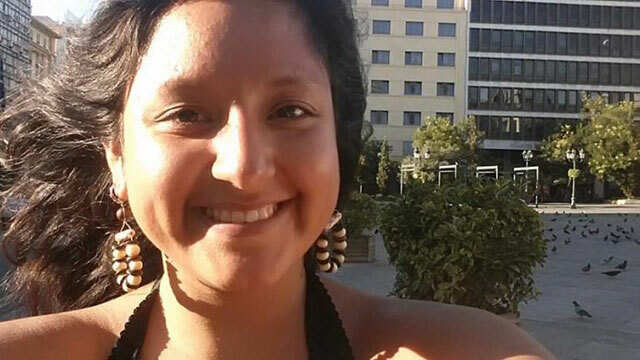 The victimization of Eleonora Roldán Mendívil for her leftist political views is an obvious example of all that is wrong with the system of short-term employment. Defending her is in the objective interest of every unionist, whatever political differences they may have. The social-democratic sellouts who block such a perspective must be fought politically and be replaced by a class-struggle leadership of the union. Throughout the controversy, the group “Against Every Form of Anti-Semitism” has been portrayed as a couple of harmless students. They use the cover of “fighting anti-Semitism” to organize campus events for people from the milieu around the “anti-German” rag Bahamas, which enthuses about vile anti-Muslim racists from late Italian ex-leftist Oriana Fallaci (who declared that Muslims in Italy “breed like rats, and they piss in baptismal fonts”) to the fascist “English Defence League.” One figure who was invited to speak at FU is Tjark Kunstreich who supported the war on Iraq and once chastised those “friends of Israel” who recoil at Avigdor Liebermann’s plan to expel all Arabs from Israel. Another is Gerhard Scheit who, in a recent article on the refugee crisis, bemoaned the lack of a “European Guantanamo” and called for the “reeducation” of refugees, “for the sake of enlightenment”. In case it has not yet become clear, the “Anti-Germans” have no place in the left – in fact, they want it destroyed. They have no problem aligning themselves with reactionary bourgeois politicians, like prominent Green Party deputy Volker Beck who recently called for an official definition of criticism of Israel as anti-Semitic (Jüdische Allgemeine, 2 March), in an article that “Against Every Form of Anti-Semitism” posted on their Facebook page. Such a definition serves to empty justified charges of anti-Semitism of all meaning. “Anti-Germans” and Zionists willfully conflate Jewish religious/ethnic minorities in various countries, the Hebrew-speaking nation in Israel, and the Zionist Israeli state. This imaginary monolithic bloc is shattered by Jewish leftists and human rights advocates who do not accept being used by Israel’s government and its supporters to justify the oppression of the Palestinians. Hence they are effectively banned from “democratic” Germany, which asserts its legal identity as the successor state of the Nazi Third Reich. For example, liberal Jewish-American historian Norman Finkelstein, the son of Holocaust survivors, cannot speak in Germany and Austria anymore without threats against him or his hosts by “Anti-Germans.” In 2010 “BAK Shalom,” an “Anti-German” group within the Left Party (Die Linke) youth organization, successfully pressured the Die Linke’s Rosa Luxemburg Foundation to cancel an event in Berlin with threats of disruptions. In January, an unholy alliance of “BAK Shalom,” Volker Beck and the hard-line Zionist-rightist Jerusalem Post tried to prevent an in-house workshop featuring Finkelstein at the Max Planck Institute in Halle, which was able to proceed under heavy security (Mitteldeutsche Zeitung, 26 January). Other examples of this Zionist witch hunt abound. This past fall, the human rights group Jewish Voice for a Just Peace in the Middle East, which includes German and Israeli citizens, had its bank account cancelled. The Bank for Social Economy, where many charities, political organizations and unions have accounts, accused the group of opposing Israel’s right to exist for participating in the boycott, divestment and sanctions movement, which tries to pressure Israel to withdraw from the Occupied Territories. The bank was tipped off by Benjamin Weinthal, correspondent for the Jerusalem Post, who smeared JVJP as being “pro-Hamas” and “anti-Semitic.” As Shir Hever, a board member of the group, put it: “This is the first time since World War Two that a German bank has closed the account of a Jewish organisation” (Middle East Eye, 8 December 2016). “Anti-German” Jungle World slandered Israeli gay rights activists as anti-Semites. 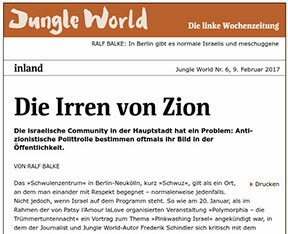 More recently, the weekly newspaper Jungle World (9 February) defamed a group of Israeli gay rights activists in an article disgustingly titled “The Lunatics of Zion.” The group “Berlin Against Pinkwashing” is portrayed as a bunch of violent savages for staging peaceful protests against attempts to use Israel’s relatively liberal gay rights legislation to alibi (i.e., “pinkwash”) Zionist oppression of Arabs in Israel and the Occupied Territories. One of their actions was a “die-in” in front of an Israeli embassy stall at a gay street fair. The article singles out two activists by name, because they dared to voice pro-Palestinian opinions after a Jungle World writer’s speech in defense of Israel. This could set them up for potential reactionary attacks and reprisals by immigration officials. They, too, are denounced as “anti-Semitic” supporters of the BDS movement. Jungle World plays an important role for the “Anti-Germans” making anti-Palestinian propaganda respectable among parts of the left and liberal public, as it has a much broader appeal than openly racist scene publications such as Bahamas, and is sold in many ordinary bookstores and newsstands. Taking a cue from right-wing demagogues on prime-time TV who loudly complain about non-existent “Sprechverbote” (speech bans), the author uses his forum of some 15,000 JW readers to whine about imaginary “Sprechverbote” – supposedly enforced by a handful of Israeli immigrants! 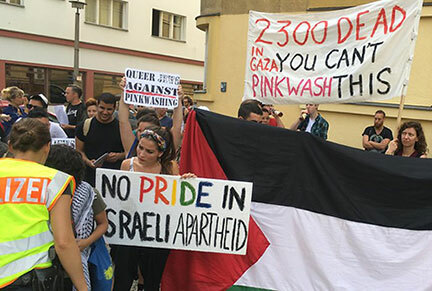 At last year’s Christopher Street Day parade in Berlin, the activists of “Berlin Against Pinkwashing” were physically assaulted – shoved and beaten with flagpoles – when they protested the speech of Israel’s ambassador, holding up signs such as “No Pride in Israeli Apartheid.” An attacker caught on video using an Israeli flag to beat a woman is Andrew Walde, a bureaucrat at the DGB union federation and Social Democratic Party candidate in the last local elections. Another, who used a rainbow flag as a weapon, is Left Party member and former Berlin Parliament deputy Oliver Höfinghoff (Berliner Kurier, 26 July 2016). The League for the Fourth International defends the proponents of boycotts, divestment and sanctions against right-wing and Zionist attacks and censorship. We denounce the recent Israeli law banning supporters of BDS or others accused of spreading “Palestinian propaganda” from entering Israel. We oppose all attempts to equate opposition to Zionism with anti-Semitism. Where debates over BDS on university campuses become a referendum on Zionism, we would critically support such calls. That does not mean, however, that we endorse BDS politically, which is misguided and wrong on several counts. Most importantly, it is not compatible with a class approach to overthrow capitalism in general and Zionist oppression in Israel/Palestine in particular. Who is going to divest and sanction Israel? The working class has no investments to divert elsewhere, nor does it hold political power in any state to impose any sanctions. Impotent consumer boycotts of Israeli goods or academics do not threaten Israel’s capitalist rulers or their imperialist patrons, but have the potential to tighten the nationalist grip of the bourgeoisie over “its” proletariat. BDS is fundamentally an appeal to imperialist corporations, governments and international institutions to intervene on behalf of the Palestinians. In the first place, this fosters illusions in bringing about a more peaceful, rational and social form of capitalism, if only enough pressure can be mounted. This illusory notion has proven deadly in the past. Recall the 1982 massacre of Sabra and Shatila, two Palestinian refugee camps in Lebanon. Palestine Liberation Organization forces had been evacuated from Lebanon under the supervision of the U.S.-led Multinational Force. Instead of bringing peace, this set the stage for Israeli occupation forces to surround the camps, while sending in their allies of the fascistic Christian Phalange militia to slaughter some 2,000 unarmed civilians. Secondly, BDS completely whitewashes the crimes of imperialist powers such as the U.S., Germany, Britain and France, to whom this “strategy” appeals. The “democratic” imperialists are responsible for unspeakable carnage all over the neo-colonial world, slaughtering millions, including in the Middle East, compared to which, quite frankly, the atrocities committed by Israel’s ruling class pale. Third, the policies of the imperialists are governed by their particular economic and political interests, which can change. However remote a possibility right now, it is conceivable that the U.S. or Germany could at some point in the future pull back from their unconditional support for Israel as a regional gendarme, as the U.S. did in the 1956 Suez war. Should this occur, it could spark a genocidal frenzy among the bloodthirsty Zionist militarists, desperate to “establish facts on the ground” while they can, by wholesale expulsion of the Palestinian population. In any case, Marxists are not in the business of advising “their” ruling class about whom to ally with. We call for international workers action in defense of the Palestinian people against the Zionist oppressors, and seek to defeat the imperialists through internationalist workers struggle, including in alliance with anti-Zionist Israeli workers and leftists. Beyond that, the entire premise is wrong. The model is the boycott, sanctions and divestment campaign against South African apartheid. Yet it was not American investors failing to buy Krugerrands or the BBC withholding broadcasting licenses that brought down that racist regime. Rather it was a fundamental shift in the world balance of forces and sharp social and class struggle in South Africa. A massive strike wave forced significant concessions from the bosses, which combined with popular upheaval posed a threat to foreign investments and, therefore to imperialist interests. Meanwhile, the crumbling of the Soviet bloc meant that the “Communist threat” in South Africa was qualitatively lessened. The U.S. and other powers started to put pressure on their white supremacist allies in South Africa to save the country for capitalism. The resulting power sharing deal with the African National Congress did just that: While legal apartheid was abolished, the black masses are still subject to superexploitation by the same local white capitalist class (now with some black capitalist front men) and their imperialist overlords, as the 2012 massacre of black miners by the ANC government showed. In fact, neither South Africa nor Israel is a “colonial settler state” where settlers act as agents of colonial rulers (and could return to the imperialist metropole if they no longer served this purpose, as French colons did following Algerian independence). 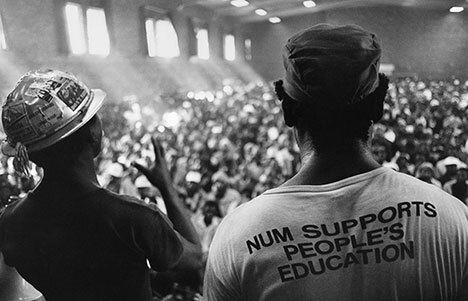 The South African apartheid regime wanted to create a permanent black working class to be exploited by white capitalists. The ideal of the Zionist state, on the other hand, is a homogenous Jewish nation state, with a Jewish working class. This means excluding as many Arabs from the Israeli economy as possible. Where Israel does impose an apartheid-like regime is in the occupied West Bank. The fascistic Zionist settlers in the Occupied Territories seek to replace this by “cleansing” what they refer to as Judea and Samaria and driving out the entire Palestinian Arab population, euphemistically called “transfer.” Trotskyists call to expel the Israeli army and all Zionist settlements from the Occupied Territories, in order to defend the Palestinian people end the occupation. Socialist Federation of the Middle East! In the Occupied Territories, Israel has established an apartheid-like system with fascistic settlers colonizing Palestinian lands. 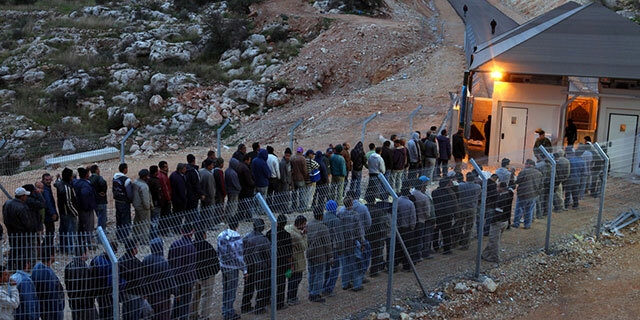 Above: Palestinian workers at Israeli checkpoint on the West Bank. The establishment of Israel was a result of the genocide of six million Jews by German imperialism in World War II. On top of this heinous crime came the refusal of the imperialist Allies to accept Jewish refugees. Israel’s 1948 “war of independence” involved the deliberate driving out of hundreds of thousands of Arabs. Many ended up in refugee camps not only in the West Bank and Gaza, but also in neighboring countries like Lebanon and Jordan, where they and their descendants remain today, viciously oppressed at the hands of local Arab rulers. The fact is that a Hebrew-speaking nation has been forged through the dispossession of Palestinian Arabs, who have also become a nation through their bitter experience of oppression. The existence of these two nations as a result of monstrous historical crimes is an accomplished fact. This is hardly unique. The American nation was built on the genocide of Native American populations and the enslavement of African Americans. Marxists do not divide the world into “good” and “bad” nations, we recognize the democratic right to self-determination of all nations while opposing all nationalist ideologies with the program of revolutionary internationalist class struggle. In a situation like Palestine, with interpenetrated populations and two nations laying claim to the same tiny piece of land, there can be no equitable solution to their competing national rights under capitalism. Capitalism is based on the nation-state, ensuring the exploitative rule of each national bourgeoisie. Trotskyists oppose the existence of a “Jewish state” and all theocratic and religion-based states, just as we oppose Islamic republics or declaredly Christian states such as Vichy France or Franco’s Spain. Moreover, the now defunct “two-state solution” of the Oslo Accords was always a formula for oppression of the Palestinians. Under capitalism, the stronger state power will dominate, in this case Israel. Who controls the waters of the Jordan? Who gets the oil? Might will decide. A “one-state solution” of a “democratic, secular Palestine” under capitalism is a pipe dream, for the Zionist oppressors fear that if they are outnumbered and overpowered, their former victims would treat them as brutally as they have treated the Palestinians for the past 70 years. The League for the Fourth International fights for Arab/Hebrew workers revolution. We hold that the only just solution is a socialist revolution that establishes a collectivized economy throughout the Middle East. In Palestine that can only come about through the joint efforts of the Arab and Hebrew workers. A separate Israeli revolution that brings the Zionist butchers to justice is inconceivable. But acting together, the impoverished Palestinian masses and a Hebrew-speaking working class that has tired of living in a garrison state under constant threat of yet another war could prevail. The first step in this direction must be a fight to win Jewish workers to the defense of the beleaguered Palestinians against the Zionist oppressor, demanding full democratic rights for Palestinians in Israel and the withdrawal of troops and settlers from the occupied West Bank. 1. In German the term “demokratischer Rechtsstaat” is often used to describe imperialist West Germany while Unrechtsregime” is used to equate the East German deformed workers state with the Nazi Third Reich. “Anti-Germans” support Zionist Israel, hail imperialist war on Afghanistan and Iraq, and attack leftist defenders of Palestinians. The “Anti-Germans” are a political current that originated with ex-leftists who moved rapidly to the right following the 1990 annexation of the German Democratic Republic (DDR, the East German bureaucratically deformed workers state) by imperialist West Germany. Elsewhere in the world such tendencies generally turned to social democracy or found their way into mainstream bourgeois politics, often through the local Green party. 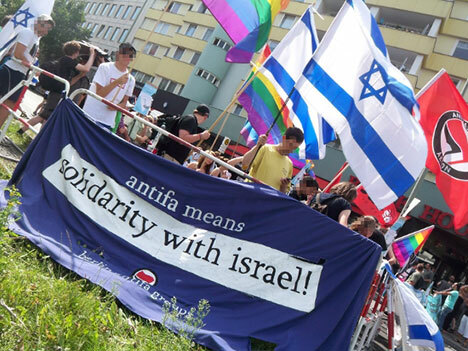 In Germany, however, a faction that continued to self-identify as “leftist” and even “communist” embraced Zionist Israel as a supposed “safe haven” for Jews, and came out in favor of imperialist interventions in the Middle East. Thus the “Anti-Germans” around the magazine konkret grotesquely supported the U.S.-led Gulf War against Iraq in 1991, which was financially underwritten by Germany, out of solidarity with Israel. In 2000 they supported Zionist repression of the Palestinian Second Intifada against Israeli occupation. After the 11 September 2001 attack on the World Trade Center and Pentagon, the Anti-Germans enlisted in the imperialist “war on terror,” denouncing “Islamofascists” and supporting the wars on Afghanistan and Iraq. In the build-up to the 2003 U.S. invasion, konkret publisher Hermann Gremliza was for an Israeli nuclear first strike against Iraq. Today, former “Anti-German” guru and writer for konkret Jürgen Elsässer heads Compact, the German far right’s equivalent of Breitbart. It would be easy to discount the “Anti-Germans” and their deranged ravings, were it not for the fact that they carry out their pro-imperialist policies by attacking leftists and immigrants. While the German army helped bomb Afghanistan, and as data on tens of thousands of Muslim men were handed over to the German police by universities and other public institutions in a racist “dragnet” to find “sleepers”, the “Anti-Germans” labeled the anti-war movement “anti-Semitic”, and assaulted leftists and immigrants, especially on campuses. Lately, the “Anti-Germans” have concentrated on smear campaigns labeling pro-Palestinian groups and individuals “anti-Semites” and then calling for censorship and expulsion of them. In fact, the “Anti-Germans” reflect the raison d’état of the “Fourth Reich” of German imperialism, which proclaims itself the legal successor state to the Nazi Third Reich. The German ruling class, which maintained its continuity even as the Hitler regime crumbled, arms and finances Zionist Israel to the hilt and uses the myth of “collective guilt,” the lie that all Germans were responsible for the Nazis’ Holocaust, in order to whitewash the German bourgeoisie’s guilt for the genocide of six million Jews, and millions of others (and to excuse its stubborn refusal to compensate Jewish survivors of death camps and forced labor).